Become a Certified Medical Examiner in the FMCSA National Registry! Perform the Commercial Driver Medical Exam! Online and On-Demand! Take the Course according to Your schedule. Includes Access to the TeamCME Practice Test! This Accredited Online 12 hour course is the most comprehensive online training available. This Accredited Online 12 hour course comprehensive! We’ve developed a training course and practice test that will better prepare you to take and pass the National Registry Certification Test! 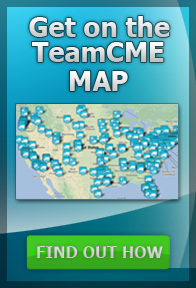 The TeamCME Online Course can be taken according to your schedule. You’ll have Unlimited Access to review all or part of the training whenever your wish. We’ve also included 1 month of free access to the critically acclaimed and challenging TeamCME Certification Practice Test on TeamCME.com. (Click Here) for more information about the most difficult, challenging and all-important TeamCME.com Practice Test. This course was updated January 2017 to include recent changes in FMCSA Medical Guidance. DCs, MDs, DOs, PAs, and ANPs that complete the four (3 hour) sessions receive a PACE accredited certificate of completion from TeamCME qualifying them to take the National Registry Certification test. TeamCME is an Accredited Training Organization fo the National Registry of Certified Medical Examiners (NRCME) which satisfies the FMCSA training requirement for MDs, DOs, DCs, APNs, and PAs to take the National Registry Certification Test. No longer available at this time. All TeamCME National Registry of Certified Medical Examiner training is accompanied by PACE certification which may provide Chiropractic “Distance Learning” CE credit for the Chiropractic profession in up to 26 states. The TeamCME Initial Medical Examiner training is an Online On-Demand Initial training course hosted by ChiroCredit.com. CEs have been applied for most states that accept distance learning. Please contact ChiroCredit.com thru their website at www.ChiroCredit.com. Then confirm CE acceptance with your state licensing board. Include in the inquiry the distinction between a “Live” and an “On-Demand” distance learning event as they are usually treated differently for CE credit. Sessions: 301, 302, 303, 304 may be registered and paid individually, or all at once as a group. When you click the link above, you will be taken to the ChiroCredit.com page. Select your profession and click submit. Look for and click “Accredited Training for the National Registry of Certified Medical Examiners 301 – 304” in the list of available training. The next page has a description of the course and the course section #s. To register for the course click on the “Register” link that is on the left side of the page. You will need to select your profession again and click continue (this list looks like it is alphabetized but it is not). Fill out the registration information to complete registering for the course. *To receive member or volume discount pricing, contact TeamCME prior to registering at 541-276-6032. 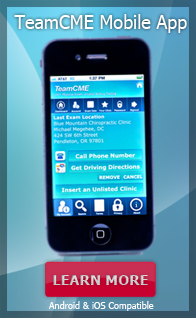 TeamCME App Users Can Save Your Office as Their Provider!